Perrin Conferences, the leading national provider of joint plaintiff/defense litigation conferences, is hosting the Natural Disaster Conference this April 2-3, 2019, at the Ritz-Carlton Coconut Grove in Miami, Florida. 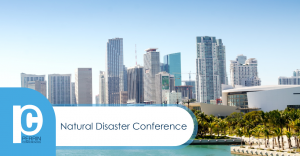 The Natural Disaster Conference will take place on April 2-3 at the Ritz-Carlton Coconut Grove in Miami, FL. WAYNE, PA, USA, February 12, 2019 /EINPresswire.com/ — Perrin Conferences, the leading national provider of joint plaintiff/defense litigation conferences, is hosting the Natural Disaster Conference this April 2-3, 2019, at the Ritz-Carlton Coconut Grove in Miami, Florida. This two-day conference will feature thought leaders’ perspectives on natural disasters and their impact on the insurance, hospitality, and real estate industries. A variety of panel discussions will focus on the effect of natural disasters on supply chains; the environmental issues and risks of natural catastrophes and pollution-related impacts; the responses by local, state, and federal governments; and much more. Perrin Conferences is applying for approximately 9.0-10.8 CLE credit hours, depending on the state. Perrin Conferences files for CLE approval for all requested states prior to the conference with materials provided, and therefore cannot guarantee accreditation by each jurisdiction's governing body. Please contact Katie Milnes at kmilnes@perrinconferences.com for any questions and to submit your CLE requests. In addition to the educational benefits received from attending, attendees also receive exclusive opportunities for networking, information sharing, and career development. For more details on registration and hotel accommodations, please contact Lynnsey Perrin at lperrin@perrinconferences.com or visit the Perrin Conferences website at www.perrinconferences.com.